Information from www.ktfnews.com may be downloaded and printed for yourself and others. All information in all its forms (text, audio, video, etc.) should not be sold or bundled with anything sold, nor should you charge a fee. It is provided for personal study or for use in preparation of sermons, small group study, or other non-commercial research. 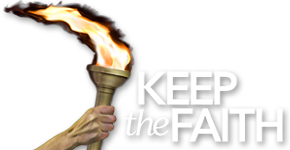 If you are planning to sell materials that include material from the Keep The Faith website, please contact us at info@ktfministry.org, or call 540-672-3553. The material on the Internet at: www.ktfnews.com <http://www.ktfnews.com/> may be placed on other internet websites. We do not require permission, but attribution to Keep The Faith should be made. Deliberate misleading or false information about Keep The Faith services or products is a violation of the Ten Commandments. You may place a link on your website to any portion of the Keep The Faith website(s) freely. However, Keep The Faith is not liable for any indirect or consequential damages of any kind. The Keep The Faith website(s) may change without notice. You must also agree that your link will be removed at any time upon Keep The Faith’s request. Misrepresentation of “Linked” relationship with Keep The Faith or implied endorsement or sponsorship of “Linked” services or products is prohibited. Keep The Faith material is not copyrighted. You may distribute as many copies of any Keep The Faith material as you wish. Attribution should be included in all shared materials. The Keep The Faith website(s) design(s) is(are) or may be copyrighted by the designer(s). Copying them in whole or in part without written permission may be a violation of copyright law. You may print screens or material with Keep the Faith designs and logos so long as you do not sell them. Providing credits including the URL from the website(s) from which the material is printed or downloaded would likely avoid copyright infringement of their copyright protection. Keep The Faith assumes no responsibility for the actions of others in this respect. Nor may these statements be construed in any way to authorize improper use or violation of copyright law in the use of copyrighted material that may be part of the Keep The Faith website. Keep The Faith will never sell, lease, or rent any information collected from our website(s). Keep The Faith does not collect personal information without your knowledge during your visit to our website(s). The information that we do collect typically correlates to the type of service you request. For example, if you sign up for our mailing list or purchase a product from us, we need to collect your name, address, and credit card, or other information where applicable to process your request(s). Providing that information is your acknowledgement that you consent to our use of the relevant information to better serve you, our guest. We also collect anonymous statistical information so that we can track how many visitors our website(s) receive(s) and how users navigate through it. When this is done, it is for the purpose of learning how to better serve our guests. On any Keep The Faith webpage on which you share personal information or perform financial transactions, Keep The Faith website(s) encrypts your data using Secure Socket Layers (SSL). Available in all major browsers, SSL encryption allows you to send and receive information without the worry of your sensitive data being intercepted by anyone other than yourself and Keep The Faith. You know that the page you are viewing is secure when your browser displays a ‘closed lock’ or other symbol to let you know that SSL has been enabled. Secure web addresses also begin with “https://” rather than the usual “http://”. Keep The Faith requests that you, our guest, read through the following terms and conditions of use of our website(s). If you do not agree with them, please do not use our site. We reserve the right to make any modifications that we deem necessary at any time. Please continue to check these terms to see what those changes may be. Your continued use of the Keep the Faith website(s) means that you accept those changes. We may use this information as we see fit, and will not necessarily treat any such submission as confidential. By submitting material in this way, you can’t sue us for using your submission or ideas derived from or implicit in the submission, nor can you request or expect payment for their use. We will have the exclusive ownership of all present and future rights to submissions of any kind and may use them in accordance with our policy and mission without compensation to you or other parties. You acknowledge that you are responsible for any submission you make to our website(s). This means that you have full responsibility for the message, including its legality, reliability, appropriateness, originality, and copyright. If you wish to submit copyrighted material to Keep The Faith, you may do so in writing to: Keep The Faith; General Delivery, Locust Dale, VA 22948. Please take appropriate steps to ensure that your material is protected under U.S. and International laws regarding copyrighted materials. Use of (or inability to use) the website(s). Use of (or inability to use) any website to which you hyperlink from our website(s). Failure of our website(s) to perform in the manner you expected or desired. Omission on our website(s). Interruption of availability of our website(s). Delay in operation or transmission of our website(s). Computer virus or line failure. Damages intended to compensate someone directly for a loss or injury. Damages reasonably expected to result from a loss or injury (known in legal terms as “consequential damages”). Other miscellaneous damages and expenses resulting directly from a loss or injury (known in legal terms as “incidental damages”). Though we try not to be negligent in any way, we are not liable even if we have been negligent or if our authorized representative has been advised of the possibility of such damages or both. Exception: Certain state laws may not allow us to limit or exclude liability for “incidental” or “consequential” damages. If you live in one of those states, the above limitation obviously would not apply. However, in any event, our liability to you for all losses, damages, injuries, and claims of any and every kind (whether the damages are claimed under the terms of a contract, or claimed to be caused by negligence or other wrongful conduct, or they are claimed under any other legal theory) will not be greater than the amount you paid to access our website(s). This agreement is effective until terminated by either party. You may terminate this agreement at any time, by no longer using our website. Keep The Faith may terminate this agreement at any time and without notice to you, if, in its sole judgment, you breach any term or condition of this agreement. In addition, by providing material on our website(s), we do not in any way promise that the materials will remain available to you upon termination. And Keep The Faith is entitled to terminate all or any part of its website(s) without notice to you. Last updated August 2010. Keep the Faith. All rights reserved.